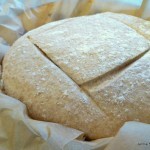 I’ve been continuing to refine my bread technique recently chronicled here and today I was sufficiently pleased with the result to share a more complete recipe for my whole wheat rye bread. For this one, I was trying to find the best balance of ease and outcome, drawing on techniques from Chad Robertson’s Tartine Bread, Jim Lahey of Sullivan Street Bakery’s no-knead technique described by Mark Bittman in a 2006 New York Times article, and a dash of Craig Ponsford’s technique shown in this nice little video on the Community Grains website. I took a class with Craig many years ago, where I was first introduced to his high-hydration technique not widely in use at the time. 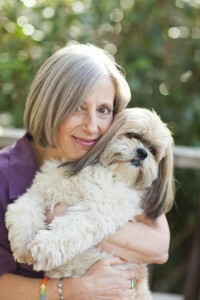 Lahey and Robertson have helped to disseminate the technique, which allows time to do the work of kneading with considerably less effort. 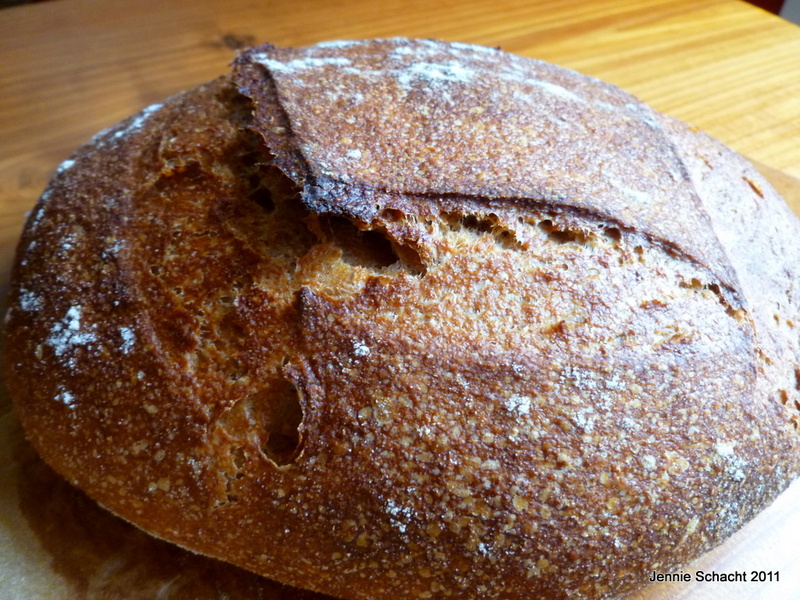 The result is a deeply soulful, flavorful bread similar to the artisan loaves that were previously difficult to achieve at home. Aside from some advance planning and a few calculations to have the finished loaf emerge from the oven when you wish, the methods are easy. If you want to impress your family, your guests, and probably yourself as well with a gorgeous loaf sporting a crackling crust, airy interior, and deeply satisfying flavor, this is the loaf for you. By the way, here’s the sticky mess that resulted when I went too heavy on the rye. 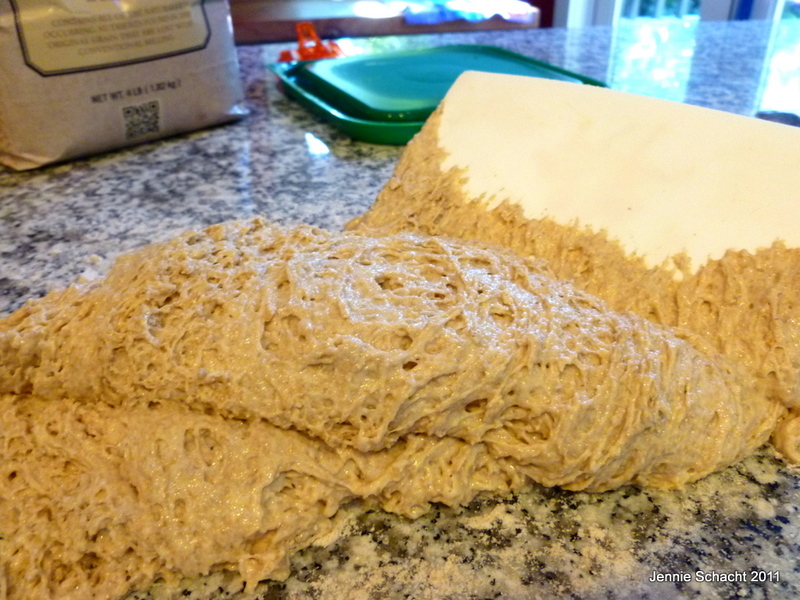 Rye flour is low in gluten and tends to gum up the works, but it adds great flavor; 75 grams worked perfectly. 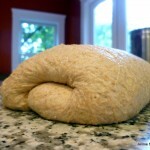 This technique makes a fantastic loaf with less effort than Roberton’s and more character than Lahey’s. I give credit to the Community Grains flour, though, for that deeply satisfying flavor. 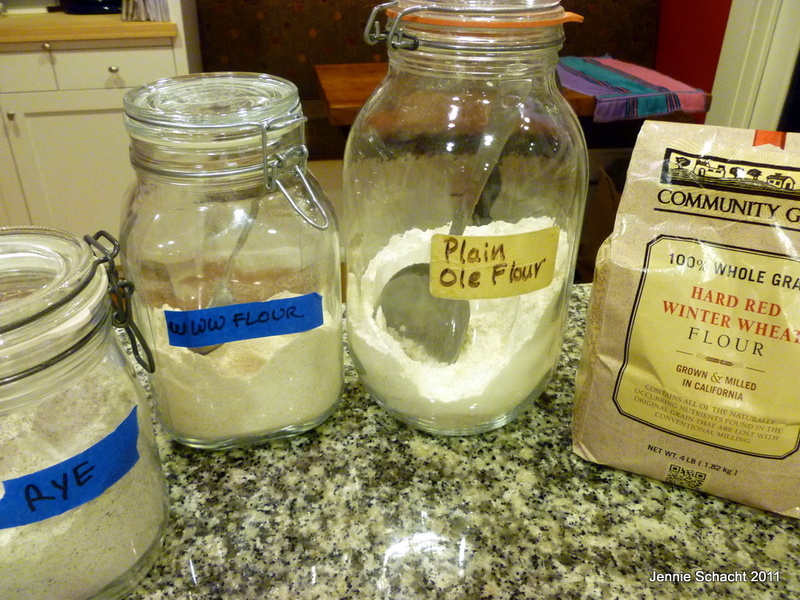 There is nothing better than locally grown and milled flour, made from the whole grain rather than tearing apart its essential elements (endosperm, germ, and bran), grinding them, then putting them back together in some calculated way. I hope you have such good flour available where you live. 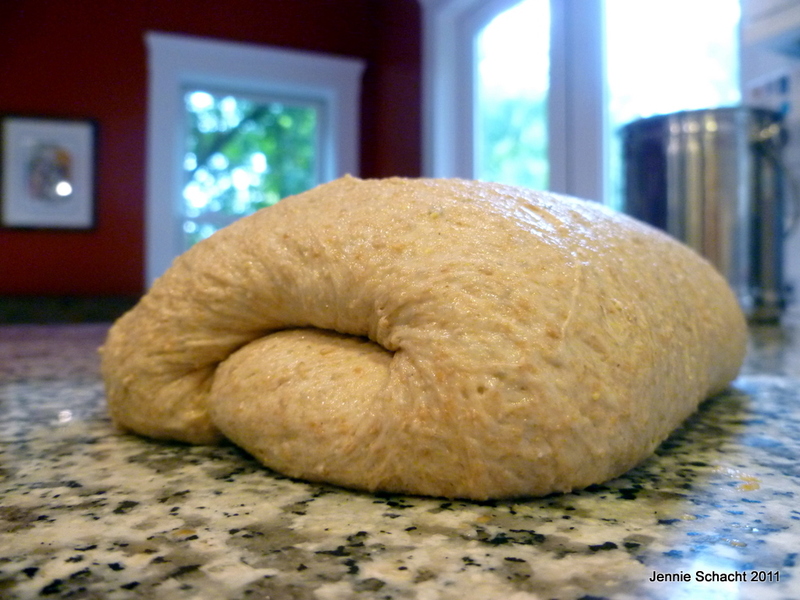 This recipe makes one good-size loaf (about 1-1/2 pounds). 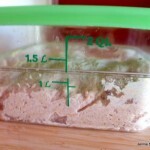 I measured as I weighed, and although your ingredients will differ from mine, if you prefer measuring by volume you should still get good results. Bread is relatively forgiving. 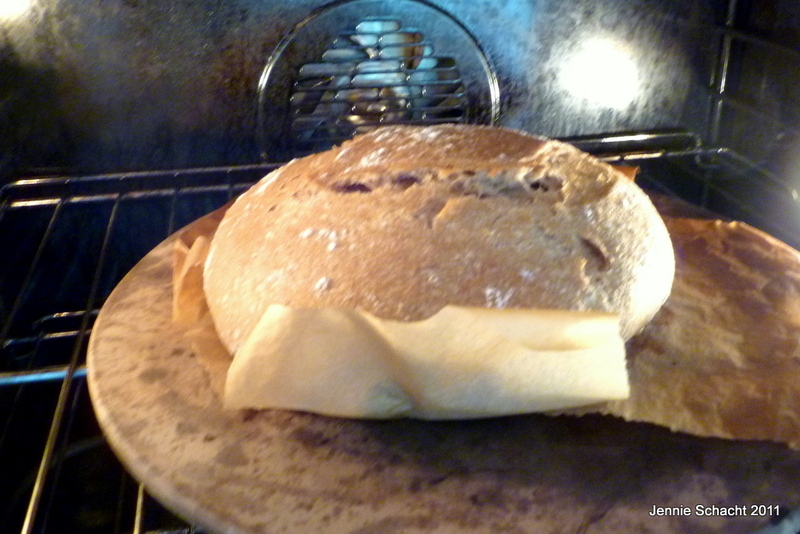 I've included timing that will get you a loaf from the oven in time for dinner. 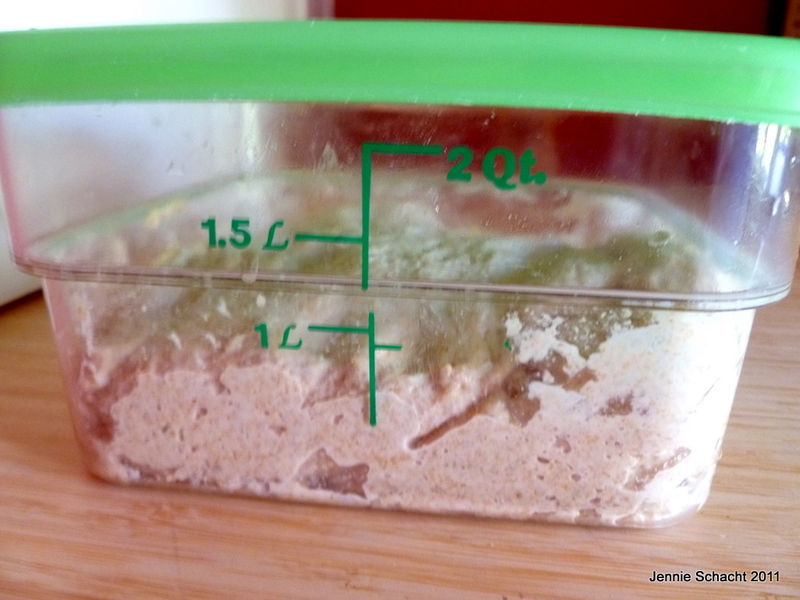 8:00pm (the night before): Measure the starter into a large, airtight container (I use a 2 quart Cambro for 1 loaf or 4 quart for 2). Add the water and stir to dissolve the starter. Add all the flour and the salt and mix well with one hand, squeezing the batter between your fingers to mix everything well. It will be quite wet and sticky. 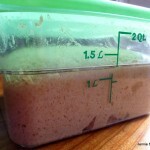 Cover with the lid and let rise at room temperature (65-75F) for 18 hours. 2:00pm (the following day): Your dough should look like this--about 50% volume increase with lots of lovely air bubbles developing in the dough. 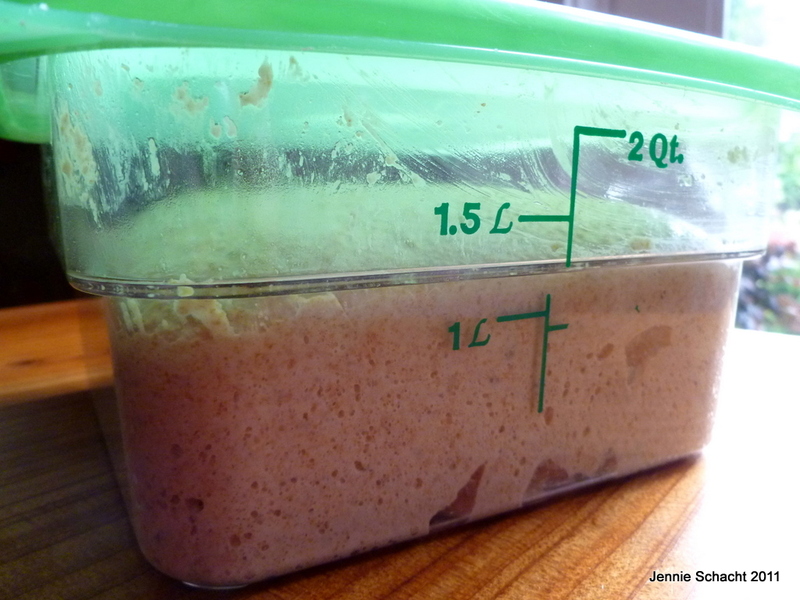 Cover the dough with a towel or your container and let it relax for 15 minutes. 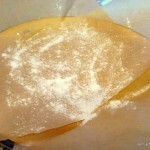 While it rests, line a bowl with parchment strips in two directions to make a sling, then dust with a little rice flour (all-purpose will do, too). Using either your moistened hands or a bit of flour (I prefer the former), cup your hands over the dough and draw it against the surface a few times to tighten the surface and form a compact ball, then transfer it seam-side down into the bowl. Cover the bowl and let rise for 3 hours. 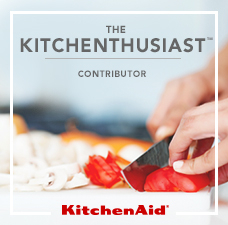 5:30pm: Slash the dough in whatever manner you like using a double-edge razor blade, a dough lame, or a small serrated knife. 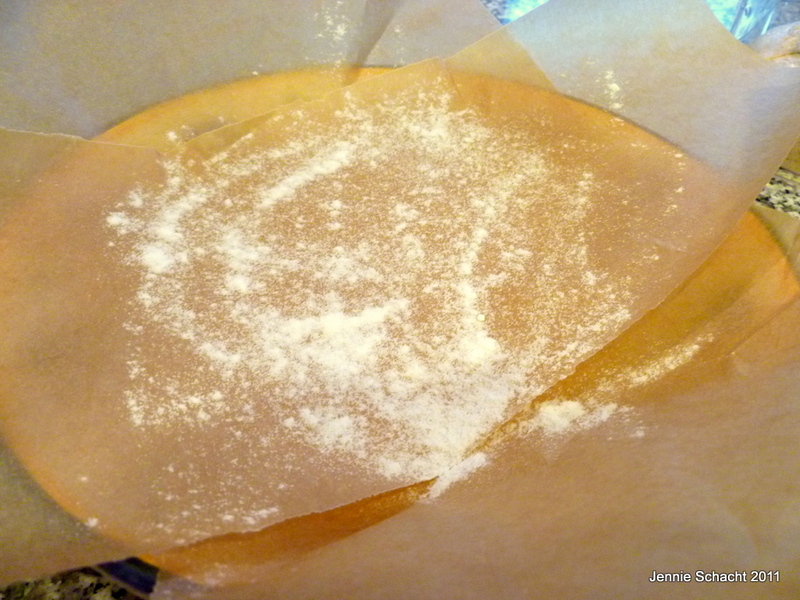 Use the parchment paper to lift the dough from its bowl and carefully slide it (with paper underneath) onto the hot stone. 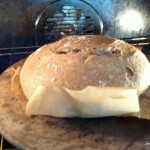 Immediately cover the bread with the pot or bowl, close the oven, and reduce the heat to 450F. Bake for 25 minutes, then carefully remove the HOT pot or bowl and let the bread continue baking until it is very brown, about 20 minutes longer. Remove the bread to a rack to cool until you can't stand it any longer, then slice using a serrated knife, load it up with butter, honey, jam, or your favorite condiment, and chomp down. And that is what “I made this!” tastes like. 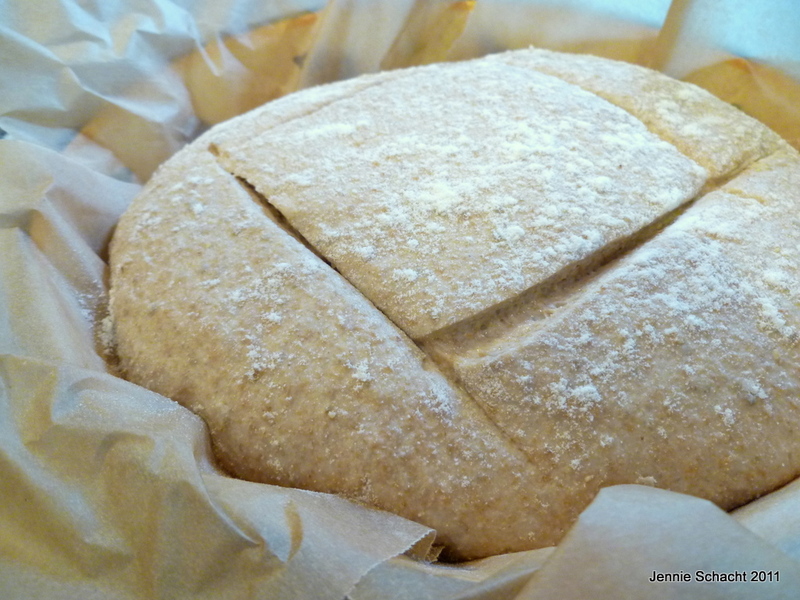 I love baking bread – it’s such a wonderful kitchen meditation for me – and I’ve made whole wheat bread lots of time, but never incorporated rye flour. This looks like a really interesting bread and I love all the photos! I’m definitely trying it!! 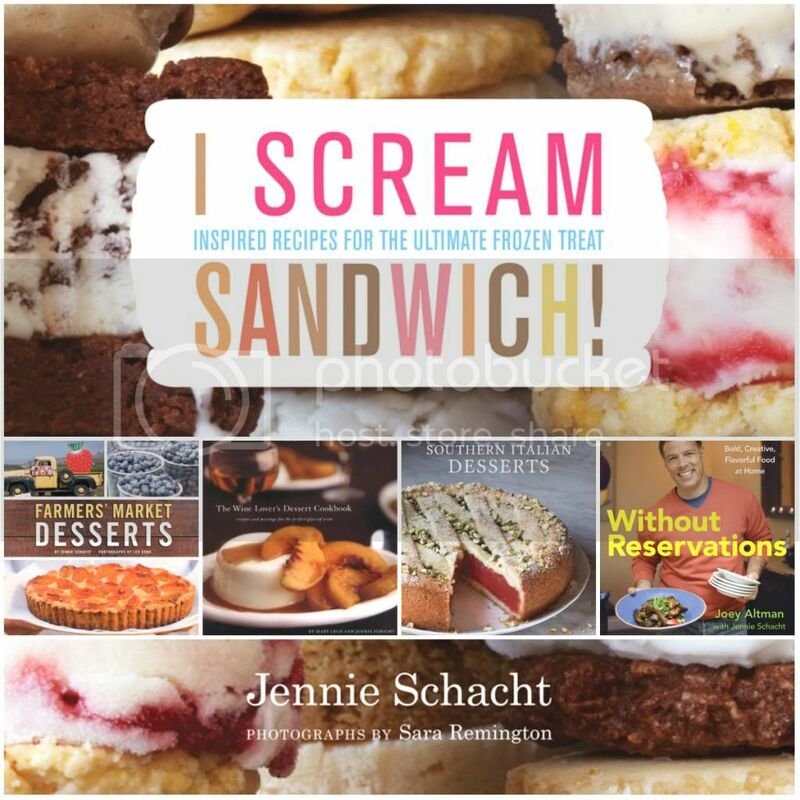 And what a great idea to chronicle your bread baking! How’s the apprenticeship going? 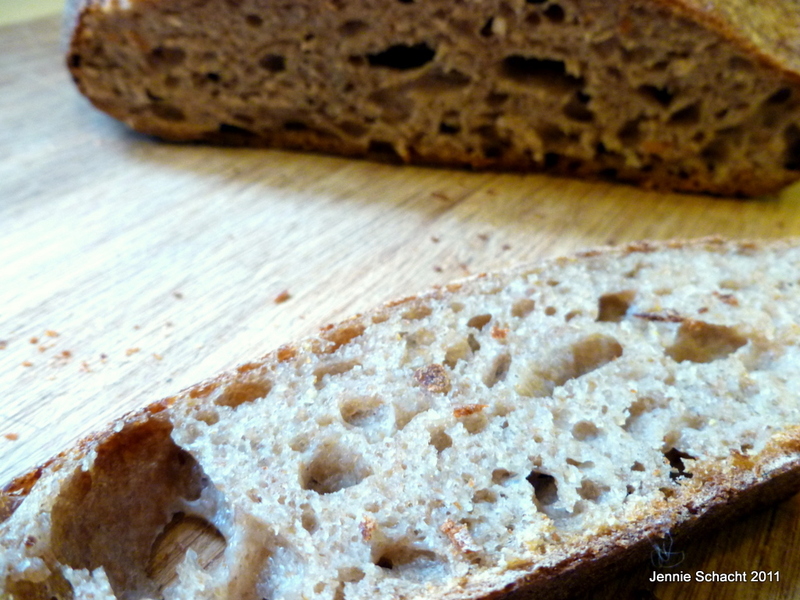 I love the chewy texture and earthy flavor rye adds. But beware — too much and you will end up with a sticky mess that won’t rise. Rye has very little gluten. Thanks, Jill, I hope he makes you some fantastic bread! I’d love for him to report back on his experience. And no worries about the knife — I’m sure he’s the sharing kind. Additional note: Serrated knife also comes in handy to keep others within sniffing distance at bay. While no housemates were harmed in the production of this miracle, waiting 3 minutes 35 seconds did seem like an eternity.